The neighbors all knew young Ann Riley. She lived with her mother and father and her big sister, Catherine, four uncles, two aunts, and a grandmother on a big, high hill in a big, tall stone house. It overlooked a bubbly little creek and lots of leafy trees. Yankees came first, from the east, on wagons pulled by oxen. They bought land, then sold it to the Germans, Saxons, Prussians, French, Luxembourgers, and Irish. Ann had a special friend whose name was Katie Murphy. 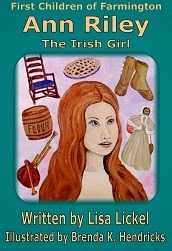 Katie was Irish, just like Ann. Katie was born in America, too, but not in Wisconsin. Ann liked to visit Katie and play at her house. Ann and Katie especially liked to listen to Katie’s grandfather tell stories. “Now, Da, don’t be scaring the wee ones,” Katie’s mother would say as she bustled about, busy as a bumble bee. “Ann Riley, who’s your grandfather?” Abbie Murphy, Katie’s little sister asked. Ann and Katie were dressing their corn cob dolls in crackly corn husk dresses. “I don’t have a grandfather,” Ann told Abbie, who was only four. “Everyone has to have a grandfather,” Abbie said. “But, who will tell you stories while you sit on his knee?” Abbie asked. Ann did not think she was poor. But she did not forget about Abbie’s question. When she got home she asked Gran Ann about it. Ann thought about the things that Katie Murphy’s grandfather did. Ann would just have to find a grandfather of her own who was just like Katie’s. Ann’s own grandfather would tell stories.